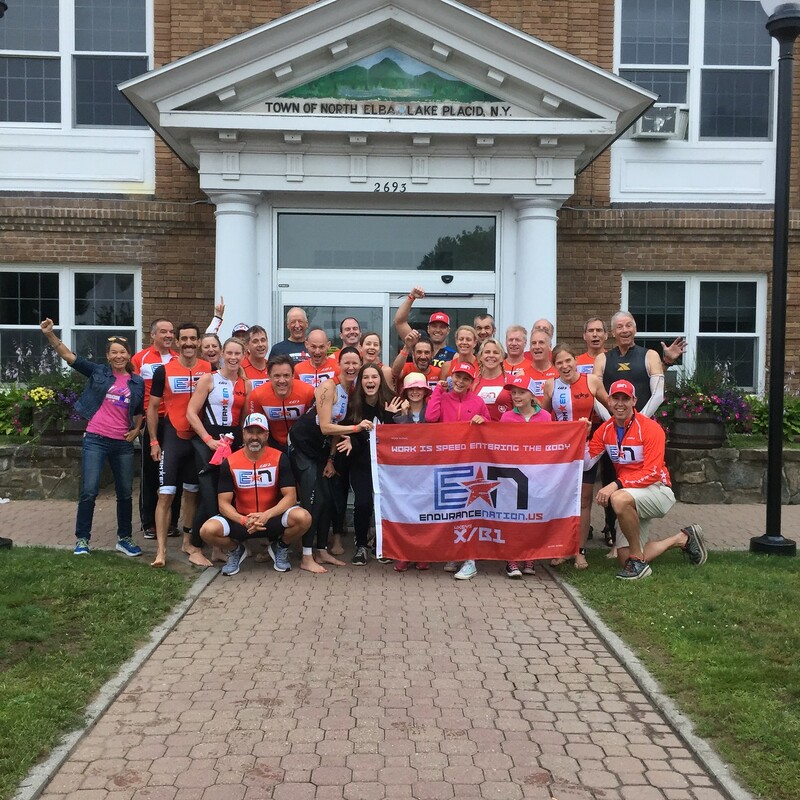 Welcome to the Endurance Nation Race Strategy page for Ironman® Lake Placid! Our goal here is to get you 100% up to speed and ready to have your best race possible. Every single race is unique, and Ironman® Lake Placid is no exception. From the underwater cable of the Mirror Lake swim, to the descent to Keene & climbing back to town, to the challenging two-loop run — you will never forget the incredible beauty and suffering on the Adirondacks. Training Discounts…. new to the team? Ask us about Key Race discounts! You might expect a race in the Adirondacks to be cool in July, but for the past three years, it has trended quite hot. Just about the only thing you don’t need to worry about is humidity. Our general guidance, for nearly every race, is to bring everything you think may need, even if you’re pretty sure you may not need it. The mountains bring the potential for almost any kind of weather, so be prepared! The Swim: Bring both your wetsuit and swim skin — the water “might” be warm enough that those of you seeking a slot for Hawaii might have to give up the neoprene. There are no currents to speak of, and everyone follows the cable so the swim is about as straightforward as it gets. Glare is never an issue with typical mornings having a slight fog over Mirror Lake, so just wear what works best for you. Side note: If you plan on swimming during an early season training weekend up there, be prepared to freeze!! The Bike: Everyone freaks out about the descent and the climbs back into town. That misses the fact there are 38 great miles of time trial space — that’s two solid hours where being aero will make a massive distance. Think aero wheels, discs, aero helmet, etc. Note that you’ll want wheels with aluminum rims (vs carbon) so your braking won’t be affected if there’s rain, etc. Outside of the flats, you’ll want to be ready for the climbs. Review the map to see which hills are actually the worst — hint, it’s not just the ones you’ve heard about. This means showing up with your best possible body composition and a light set up. For gearing, we nearly always recommend a compact crank (50/34) or “super compact” (52/36) if you’re a bit of a stronger rider on an 11-speed bike. Everyone should have at least a 27-tooth cog on their cassette (for example, a 27-11 for stronger riders), with less strong riders always benefiting from a 28t or higher (for example, a 28-12 cassette). Not that you NEED it to climb the hills, but that you should spin in order to save your legs for the run! The Run: Unique in that the outbound portion of the run is predominantly downhill…making for a less-than-ideal return trip to town and Lap Two. You’ll want comfortable running shoes laced properly as there’s quite a bit of steep descend that can take its toll. Once again, the variable weather demands you have every possible situation covered. At a minimum we’d recommend a visor or hat — blocks the sun, rain and golf-ball-sized hail! A hydration belt is good in case the temps are through the roof. Power Tip: Pack a special treat (to grab at halfway) — you’ll likely need some kind of mojo to get you over the final 3+ miles of climbing. And likely Coke alone won’t do it. Coach Patrick’s go to mojo-filled item of choice — jelly beans! The Lake Placid swim is a two loop affair in Mirror Lake, from a beach start. You’ll swim directly out from shore about 800m, turn right and swim about 100m, turn right again and swim back towards the pier. You’ll go around it, exit the water, run over a timing mat, then run/swim out to the first buoy, repeat. From 1999 to 2013, the Lake Placid swim start had gained a reputation for being one of the most crowded in the sport. With nearly 3000 athletes all jammed into a narrow beach there was a LOT of contact. The permanent underwater cable made life easier, but still, it was tough. With the new wave swim start protocol instituted for the 2013 race, things went much more smoothly for all save for the Pros, who only just finished their first lap right after the final Age Groupers entered the water. There is a “pro lane” to help them maintain their speed. >> View Online Map here. Please Note: Lake Placid has one of the longer transitions in the sport. It’s basically a long run from the lake, up a street, and into an oval concrete skating rink. Your bags are hung outside on racks (T1 on top, T2 on bottom), your bike is racked on shaded grass, and the changing tent is between them. By the time you exit transition at the mount line, you will have covered more than a 1/2 a mile! This is your first chance to blow the entire race. IGNORE the hammerheads and others racing, be safe and just get out to the lake. The same drill when you come back into town and start lap number two, but you’ll be much more tired. If you reference the bike course profile, you’ll see the descent and the rolling to flat sections of Keene, Upper Jay, Jay, and Ausable Forks. The first lap is generally free, but by lap two the wind here is pretty significant and can really slow you down you have over-achieved early on. Just sit down, relax, and get into a really nice groove. In our opinion, this 27-mile section, which you’ll do two times for a total of 54 miles, is essentially free. Just ride steady, ride your race, and ignore the other athletes around you. After your “free” early miles you’ll turn right on Hwy 86 and effectively cross over to Wilmington before you start the true climb back into town. Right away you are slapped with a real solid climb — aka “Foundation Hill.” After a way-too-short descent, you have two more short and steep climbs that will test your patience. This is the section of the course that no one talks about — it’s lost in the elevation profile and it under-appreciated until the second lap where everyone who biked too hard too early is now wondering how they will ever make it back into town. After a brief respite on Haselton Road, you will begin the process of riding back up to Lake Placid proper. This section starts off innocently enough until the road really pitches up to cross a river, and again at the Whiteface Mountain entrance and right after to the picnic area. This early part of the climb is truly the worst and is “only” four miles long. Then you have a respite past the High Falls Gorge, some rollers along the stone wall and then more speed with slight rollers though Mile 51. Then you begin the second half of the climb, working your way up to the top of “Poppa Bear Hill” and heading into town. Truth be told, this climb can be fast if you work the speedy parts and ride the rest smart. If there’s a headwind coming down, then nothing can really help you, you’ll have to just get it done. As you head into town and around the lake, you’ll pass the Bike Special Needs area and enjoy some really great support from the crowds. This section eventually turns rolling along the river. You’ll then flip it and run back. Enjoy the crowd support and the mojo as you leave transition then settle in for the run along the river. The Ski Jump Hill; approximately 1/4 mile long right as you exit River Road. Townie Hill; approximately 1 mile long that takes you from Lisa G’s up to the Placid Brew Pub — this is the worst hill on an entire day. Even past the Pub, you still have a slight climb to the turn around there before heading back towards the start of lap two / the finish area. Just put your head down in the last 3 miles. The many climbs and twists in this section make it very difficult to maintain a sense of where you are relative to the finish line, even though you have to run right past it. Just. Keep. Moving. Ht Nation is the world’s leading age group coaching service, with more than 700 active members saving time and building fitness for their next big race. Create a free trial to get your personalized season plan and begin preparing for your next big race with our community, resource library, discounts and much more!